I am super exited to share some fun and inspiration with you today. 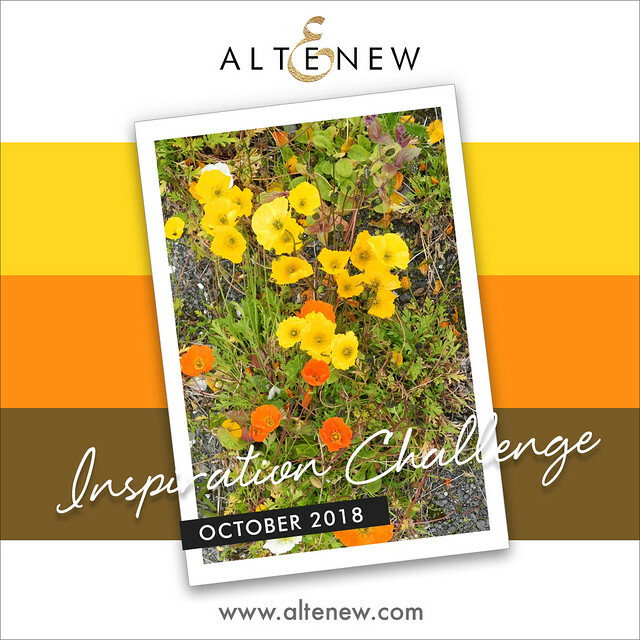 You see, it is my turn to host the monthly Altenew Inspiration Challenge for October. Seeking inspiration from nature is my favorite thing to do when traveling. This past August, I had the pleasure of visiting Iceland. During the tour to a fishing village, I caught the sight of roadside flowers and there they were…field of poppy flowers! I quickly snapped a few photos and it is now the color combo for our October Inspiration Challenge! The wonderful 36 Pan Watercolor Set immediately came to my mind when creating my own color palette. I die cut the Leaf Frame Cover Die and watercolored the entire panel in Mocha and Espresso. I then set it aside to dry. 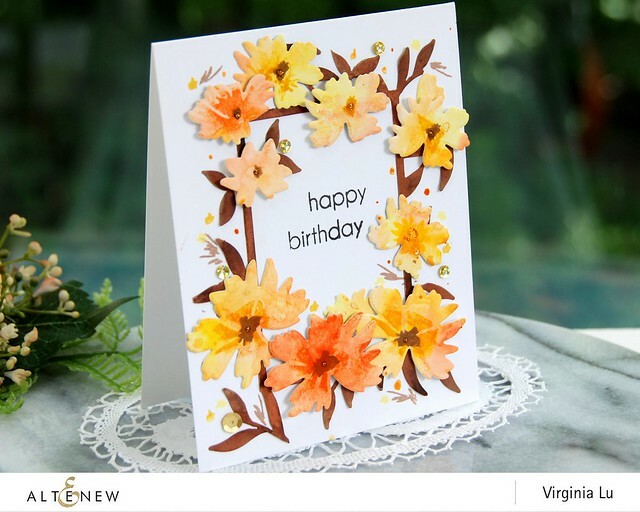 For the flowers, I created my own watercolor paper by applying Citrus Burst, Fresh Lemon, Warm Sunshine, Sunkissed and Orange Cream and let the paper dry. 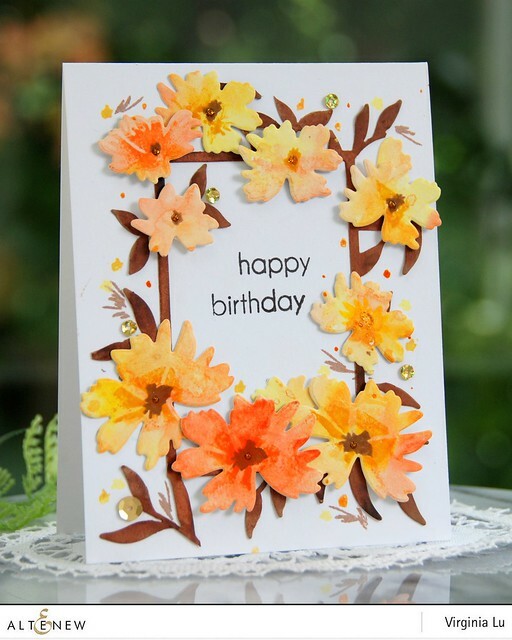 Once dried, I took out the Wildflower Garden Die Set and started die cutting the larger flowers with Mini Blossom. 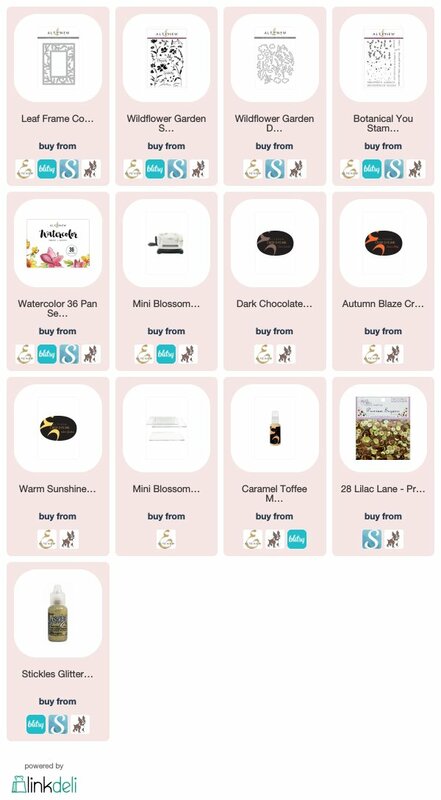 It really didn’t take long to create as you get so many flowers in one sheet! 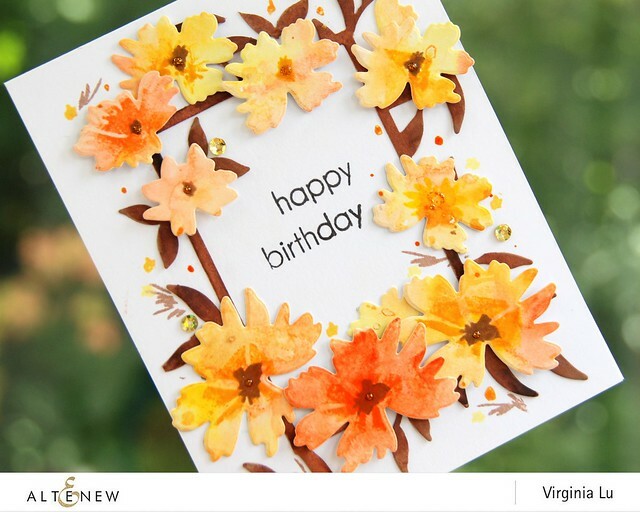 To give more depths to the Wildflowers, I stamped the flower center in various colors with Autumn Blaze, Warm Sunshine, Dark Chocolate. Parts of the Leaf Frame Cover Die was then trimmed off. This gives the overall a relaxing and fancy-free feeling. After all, they are wild flowers, right? 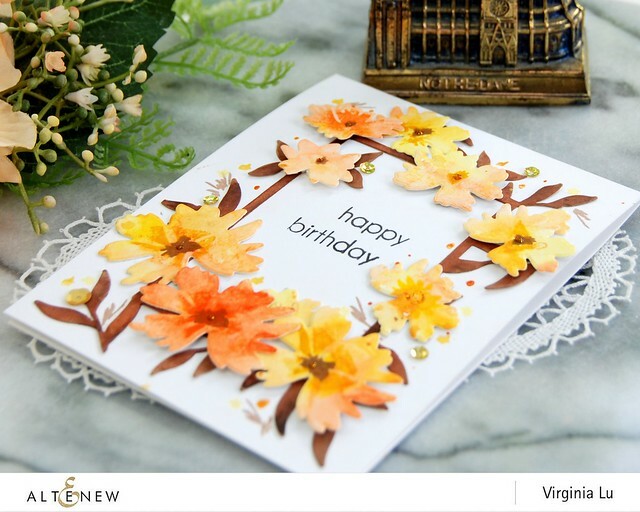 The “Happy Birthday” sentiment was stamped from the Botanical You Stamp Set. I stamped more details and added splatter with Caramel Toffee Metallic Shimmer Ink Spray. 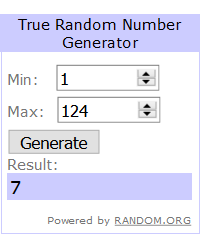 I hope you are inspired by the rich deep color combo and please give this challenge a try (see here)! Oh my gosh, your cards are stunning. I love this washi tape and the different ways to use it. Thank you so much for sharing. I can't wait to get these tapes, you've really inspired me. 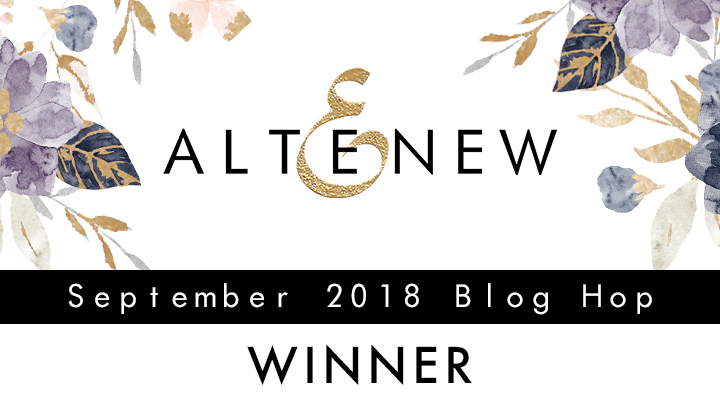 Congratulations, Lori R. ,please e-mail me at virginia@altenew.com to claim your prize! Thank you, everyone, for leaving me sweet and skind comments! Nice color choices for this month's challenge. Very timely. 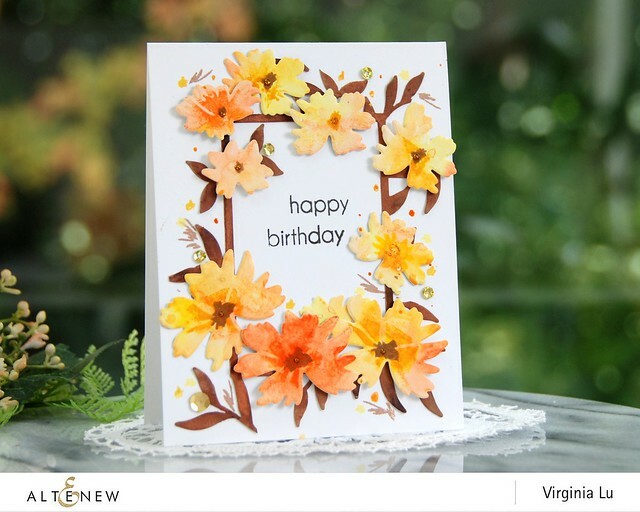 Love your challenge card sample, too!-Maria Giselle B. 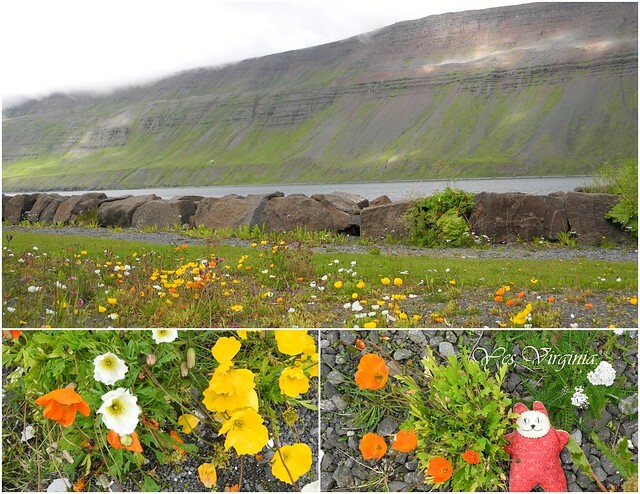 Think you captured those Icelandic poppies just perfectly. Love how they've been rounded up in that gorgeous frame. Such a beautiful card. Thank you for the wonderful inspiration!!! what a gorgeous colour combo Virginia. And your card is the perfect inspiration. Love the photos of the poppies in the wild. Love the wildflower frame and congrats to Lori. This is so inspiring - the colours...everything about it is gorgeous!